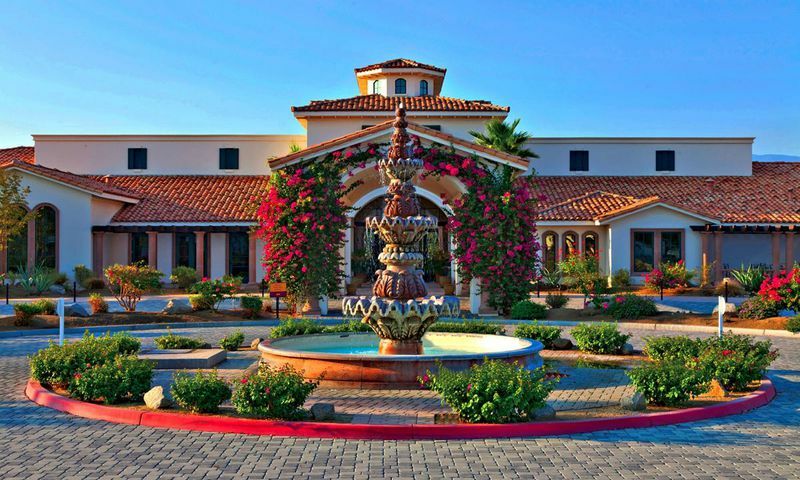 Nestled in the heart of the Coachella Valley, Villa Portofino in Palm Desert, CA, is an active adult community that is comprised of luxurious villas and single-family homes and welcomes new buyers aged 55 and better. The one to three bedroom residences wind among paved stone streets and are connected by landscaped walking trails. Situated on 50 acres, these stunning homes are surrounded by vistas of the Santa Rosa and San Jacinto mountains. This gated community exhibits an Italian flair with tranquil waterways, graceful columns, gentle arches, and windows laced with ironwork. The detailed craftsmanship extends to the grand clubhouse. Exterior building maintenance, pest control and upkeep of the grounds are all handled by the community. The luxurious 30,000 square-foot clubhouse is where residents gather to socialize and stay in shape. A fitness room and a yoga studio are sure to diversify your exercise routine. Social areas abound with a two dining areas, a game room and a 100-seat movie theater. The Dream Game Room includes a sports bar, multiple big-screen TVs, pool tables, and a poker room. At the theater, residents can take in complimentary matinee and evening shows and partake in monthly seminars. Other designated areas include an art studio, a bridge room, a quiet library sitting room and a creative crafts room. Residents even have use of an on-site beauty salon. The terrific amenities continue throughout the grounds at Villa Portofino. Here, residents will find a sparkling pool and soothing spa with cantina, as well as a nine-hole putting course that meanders through a beautiful water stream. Villa Portofino was established in 2005. Upon completion the community will encompass 460 homes. In 2011, Family Development acquired the community and built a handful of homes that were 1,009 and 1,610 square feet. The Cortona I features one bedroom and one bath and the Cortona II features two bedrooms and two baths. Both models are available on a resale basis. They have covered loggias with storage space and laundry area, and the latter also has a den. Each building has an elevator for residents' convenience. Homeowners who reside in the Cortona I and Cortona II models take advantage of the great amenities they feature. Resident chefs will enjoy the gourmet kitchens, which are equipped with stainless steel ranges and dishwashers, granite counter tops and elegant maple cabinetry. The master bathrooms have separate showers and tubs. The floor plans even include built-in wet bars, Travertine tiles, solid core doors with pewter hardware, soaring ten-foot coffered ceilings, French doors, security systems as well as gas burning fire places in the living areas. Homes have energy-efficient HVAC and thermostats with night set-backs. In 2013 Comstock Homes acquired the remaining homesites in Villa Portofino. They offer six additional attached home floor plans that range in size from 1,183 to 1,926 square feet of living space. These homes feature one to three bedrooms, one-and-a-half to two bathrooms and an attached one or two-car garage. Each residence is thoughtfully designed with high ceilings, granite countertops, and allow an abundance of natural light. Villa Portofino began offering single-family floor plans in 2014. These units range in size from nearly 1,900 to over 2,300 square feet and offer two to three bedrooms, two or two-and-a-half bathrooms and an attached two-car garage. The homeowners association fees include structural fire insurance, general ground maintenance, all exterior maintenance, exterior pest control, exterior window washing, cable TV as well as water and trash service. Villa Portofino offers a prestigious location and luxurious amenities. Its residents enjoy a maintenance-free lifestyle that leaves them time to enjoy a relaxed life and good health. With its central location in Palm Desert, convenience is another desirable factor of this world-class neighborhood. Villa Portofino also offers residents several activities and groups to stay active. Join a game of bingo, canasta or poker or simply enjoy an evening with friends at happy hour or holiday parties. Villa Portofino allows several opportunities for remaining physically fit with classes that range from water aerobics to Zumba. However you like to spend your free time, Villa Portofino will have something for you. Centrally located in Palm Desert, California and in proximity of the I-10 Freeway, Villa Portofino is within minutes of shops, restaurants and entertainment venues. Medical facilities like the Eisenhower Medical Center are also nearby. Popular cultural destinations in Palm Desert include the McCallum Theatre for the Performing Arts and the Palm Springs Air Museum. With an average temperature of 74 degrees, residents have plenty of opportunities to enjoy the outdoors. Play golf at the Desert Willow Golf Resort, experience local flora and fauna at The Living Desert Zoo & Gardens, hike the trails area for striking views of the San Jacinto mountains, or walk the dog or take a picnic basket to any of the local parks. Villa Portofino is also near Los Angeles, Orange County and San Diego. When your next destination is farther away, the Palm Springs International Airport is just eleven miles from the community. Villa Portofino has the amenities, lifestyle, and desirable area to stand out as a terrific active adult community in Palm Desert, California. There are plenty of activities available in Villa Portofino. Here is a sample of some of the clubs, activities and classes offered here. Family Development offered two models: The Cortona I features one bedroom and one bath and the Cortona II features two bedrooms and two baths. Both models are available on a resale basis. They have covered loggias with storage space and laundry area, and the latter also has a den. Each building has an elevator and each unit has gourmet kitchens, some of which are equipped with stainless steel ranges and dishwashers, granite counter tops and elegant maple cabinetry. Comstock Homes offers three additional floor plans that range in size from 1,183 to 1,494 square feet of living space. These homes feature one to two bedrooms, one-and-a-half to two bathrooms and an attached two-car garage. Each residence is thoughtfully designed with high ceilings, granite countertops and to let a lot of natural light in. The Ravello Collection consists of three attached models. Available as new homes, these units range from approximately 1,600 to over 1,900 square feet of living space and offer two to three bedrooms, two bathrooms and an attached one or two-car garage. Villa Portofino now offers three single-family floor plans available as new homes. These units range in size from nearly 1,900 to over 2,300 square feet and offer two to three bedrooms, two or two-and-a-half bathrooms and an attached two-car garage. Portofino is a really unique little community that brings me back to vacations in Italy. Well, ok, I'd rather actually live in Italy but the architecture here is reminiscent! I like the stone streets and winding trails, the clay tile roofs, fountains and arching windows. I moved in here a few years back and really like how special it feels here. The homes are not your typical cookie-cutter style and all the community features are very nice. The mountain views are beautiful too! 55places.com is not affiliated with the developer(s) or homeowners association of Villa Portofino. The information you submit is distributed to a 55places.com Partner Agent, who is a licensed real estate agent. The information regarding Villa Portofino has not been verified or approved by the developer or homeowners association. Please verify all information prior to purchasing. 55places.com is not responsible for any errors regarding the information displayed on this website.